This weekend, I made my way up to California’s Central Valley. It turned out to be a very interesting and fruitful trip. 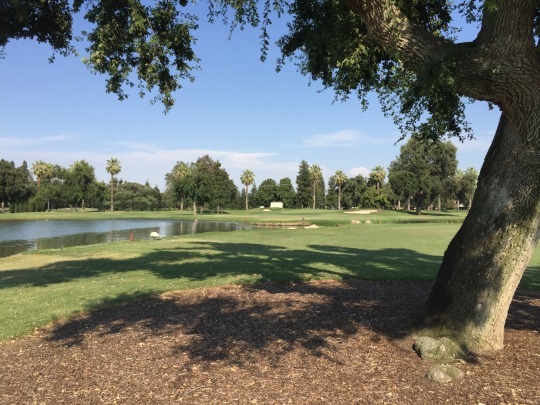 It all started when a friend (and fellow course collector) was able to set up a round at the private Sunnyside Country Club in Fresno on Saturday afternoon. I wasn’t too excited about the prospect of driving 4.5 hours just to play one course and come back home. However, I’ve played all the public courses in the region and there was nothing else I needed to play that wasn’t private. 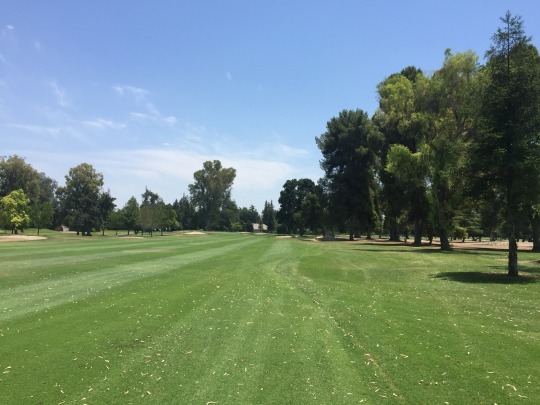 With the luck I’ve been having with my recent email campaign to SoCal private clubs, I decided to give it a shot and reach out to several more in the Central Valley. 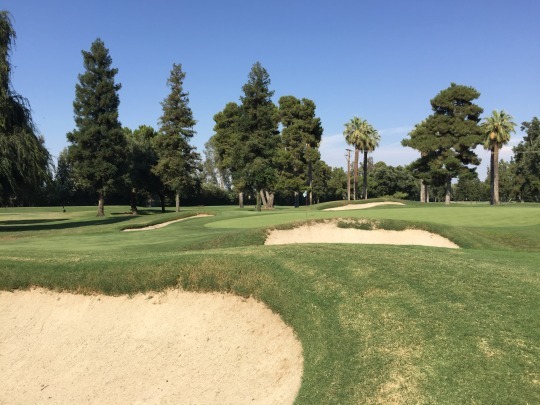 Sunnyside is one of the oldest courses in all of California, with its roots dating all the way back to 1911. I believe it falls somewhere in the top 10 of oldest-still-active courses in the state. 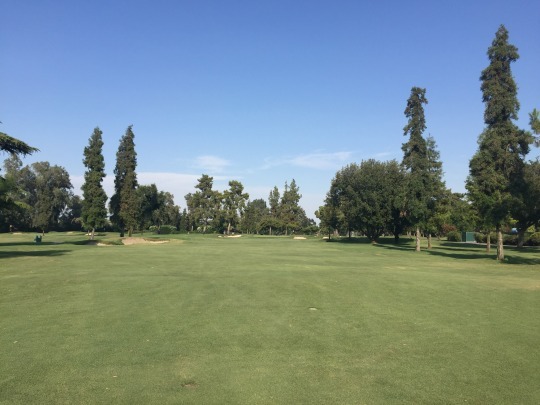 Catalina Island, Del Monte, Presidio, Redlands CC, Mare Island and Victoria Club are the others that come to mind among the very oldest. 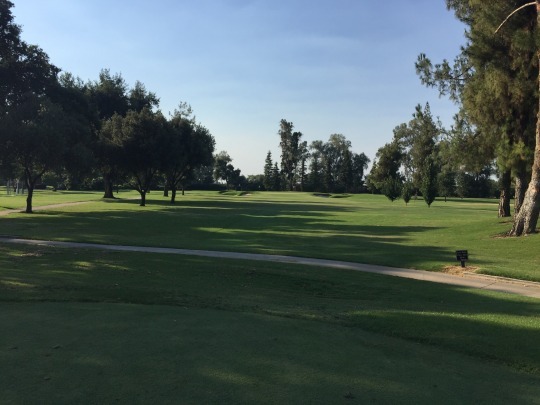 Either way, Sunnyside does claim to be the first course built in Central California. In other words, it’s an old course. I do not know how the current version of the course compares with any original elements. I can say it does feel old and the design feels very simplistic. From the moment you pull into the parking lot, you can tell this is a place with a lot of history. Everything about it is pretty basic and it suits the character of such an old club. 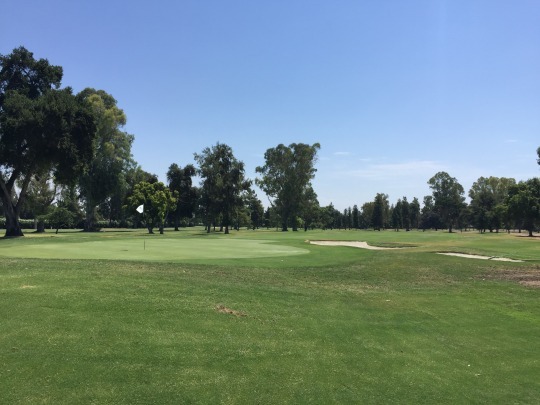 The clubhouse is modest, yet very comfortable with a family-friendly atmosphere. The detached pro shop is right by the first tee. We checked in there and were on our way. We played as a foursome (more like three-and-a-half as one member of our group was just riding along and hitting a few balls here and there). It wasn’t very busy out there on a really hot and stuffy day. However, we still ended up just behind a sixsome of members. As guests, we tried not to push them too hard. The good news is they still moved along at a great pace and we finished in about 3 hours, 45 minutes. 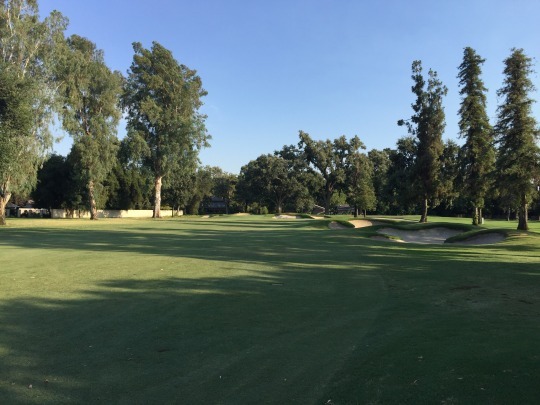 Like a lot of old courses throughout California, William P. Bell’s name is attached to Sunnyside as the main architect. 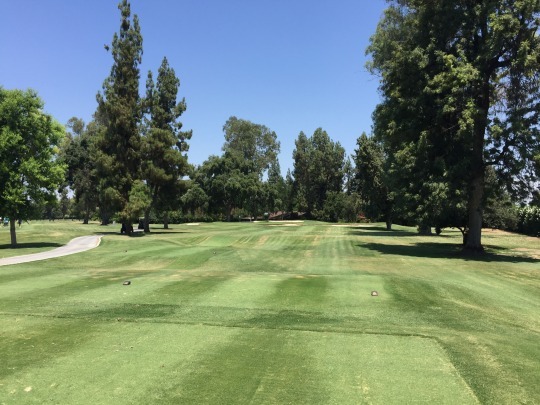 The layout is very straightforward, especially throughout the front nine. Most holes are dead straight and what you see is what you get. 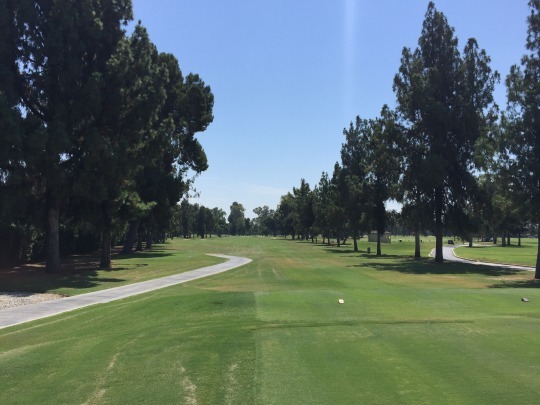 The routing goes back and forth with tree-lined fairways and the terrain is very flat overall. 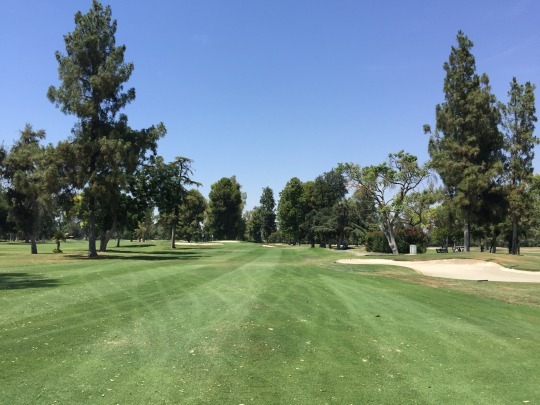 The back nine does get more interesting with a few doglegs, but it still isn’t anything that will jump out at you much. 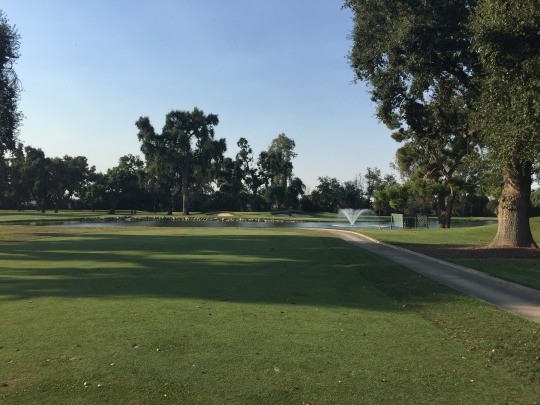 There are no water hazards on the course and only a handful of OB areas along the outer edges of the property. As I said, what you see is what you get. 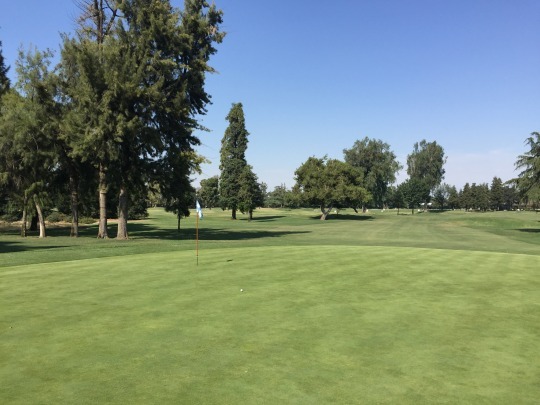 It’s bare bones old school Central Valley golf in its purest sense. 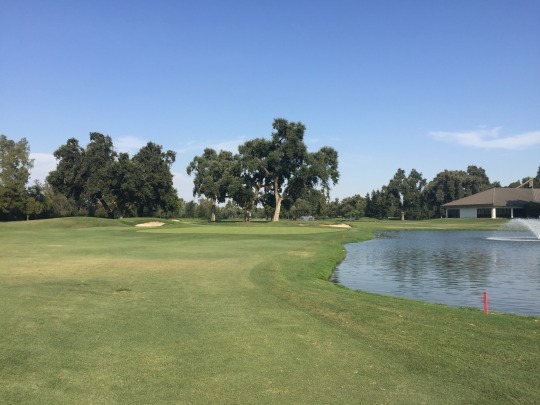 Ultimately, the history of the club is more interesting than the course itself, but there’s still a certain level of classic charm when you put it all together. I don’t get the feeling it’s been renovated a bunch of times and that’s a good thing (though I’ll admit my next course review might completely contradict that exact point). 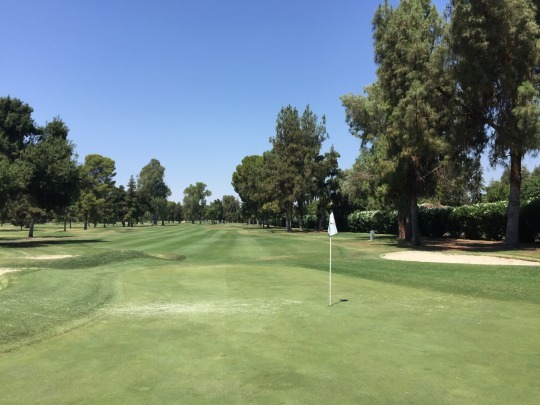 The course was in pretty good overall condition, especially considering how darn hot it has been this summer. It was well over 100 on Saturday without much breeze other than the temporary relief provided by the big fans used to keep the greens cooled down. The tee boxes were good. 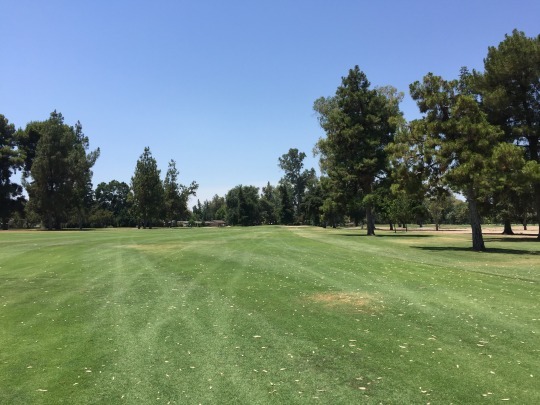 The fairways were mostly nice with just some brown/thin spots scattered here and there. The rough had some areas where work was being done (aeration, resodding, etc.) but was mostly in decent shape. It was cut down low, but the grass was grabby and made you work more than expected. 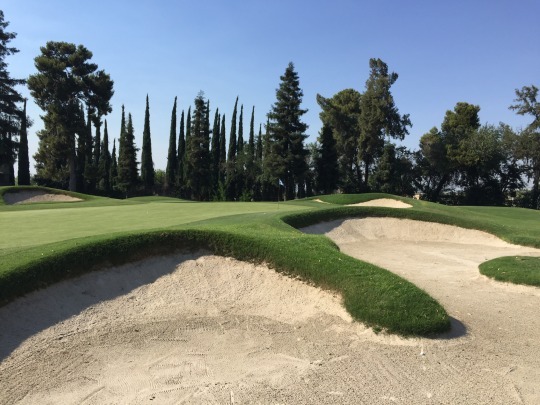 The bunkers were exceptional with soft, sparkling light color sand. The greens were also rather nice. They were very soft (tons of bite) and rolling pretty smooth at medium speeds (a tad slower than they looked). I did notice a number of unrepaired ball marks, though, which was unfortunate at a private club like this. Is Sunnyside a must-play? 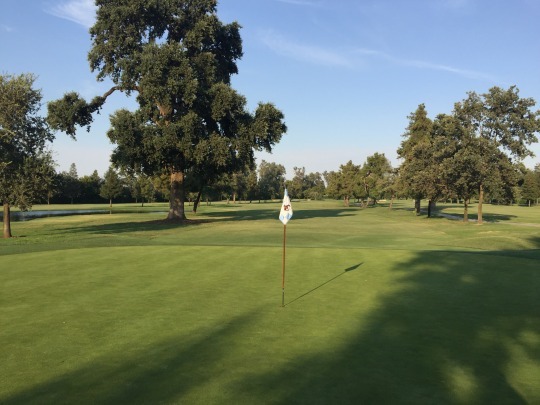 If you are obsessed with the history of golf in California, then it should be on your list. If not, then you may not feel much need to go out of the way for it. 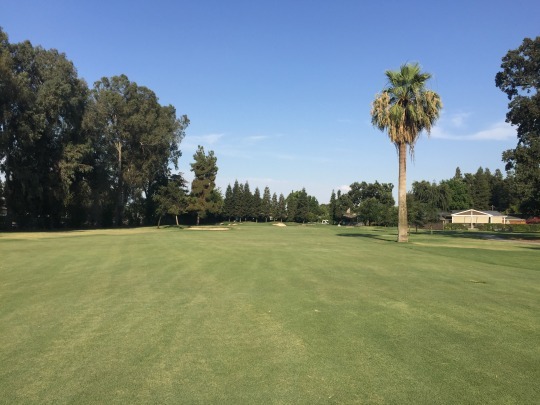 I would guess locals gladly take advantage of any opportunity to get out here because of the Central Valley history and tradition this club represents. 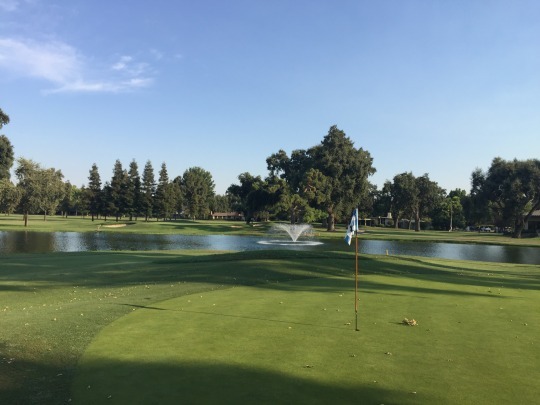 I was able to arrange an invite to play the course, and it worked out well to set up our round at Visalia Country Club in the evening after Sunnyside. 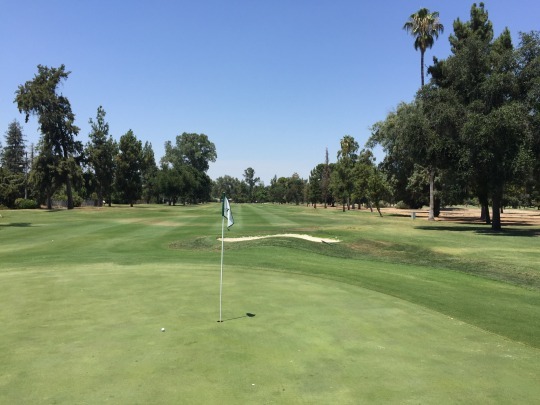 We headed down the freeway to Visalia and teed it up here around 4:00. We were just a twosome here and we finished quickly. It was still really hot and there was no wind, so we didn’t stick around longer than we needed to. The clubhouse and detached pro shop/snack bar area had a similar feel to Sunnyside. Pretty simplistic and classic, with a “no frills” kind of presentation. Admittedly, I did not go into the clubhouse/restaurant area at all, so it could have been really nice/fancy/modern inside. 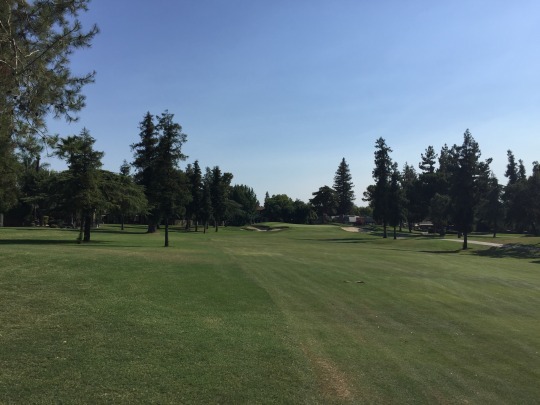 Visalia CC also has a very rich history, with the original club/course dating back to 1922. 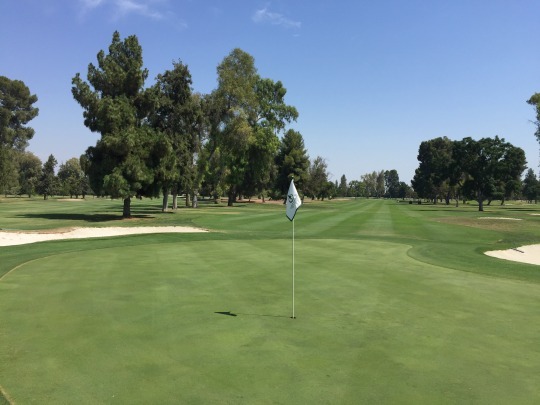 It started with three basic holes with oiled sand greens. 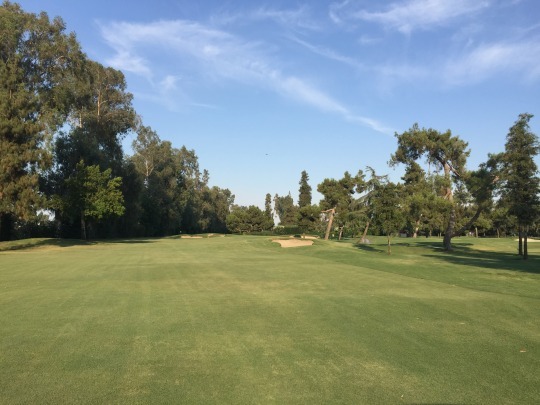 Eventually, nine holes were completed and everything was converted to grass. Nine more holes came later to complete the 18-hole layout. Multiple renovations have happened over the years, with designers Bob Putman, Robert Muir Graves and Desmond Muirhead all making their marks at various points in time. 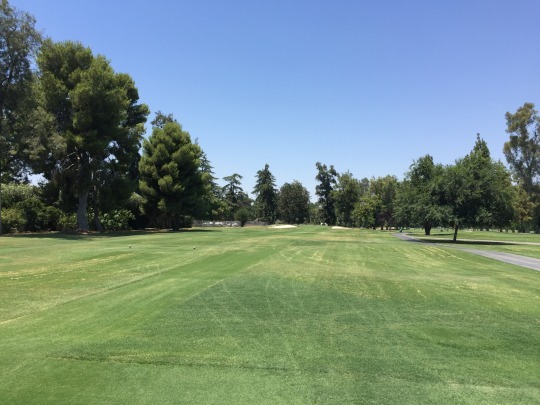 The result is what I would still consider a pretty traditional Central Valley kind of course from tee to green. 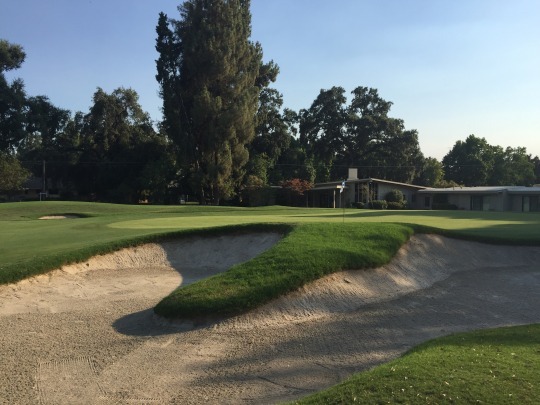 However, around the greens there is a lot of somewhat modern character thanks to some serious bunkering. The bunkers here are fabulous. They are deep and made up of unique shapes, mounds and slopes. They are a combination of form and function, both looking nice and providing an added level of challenge. 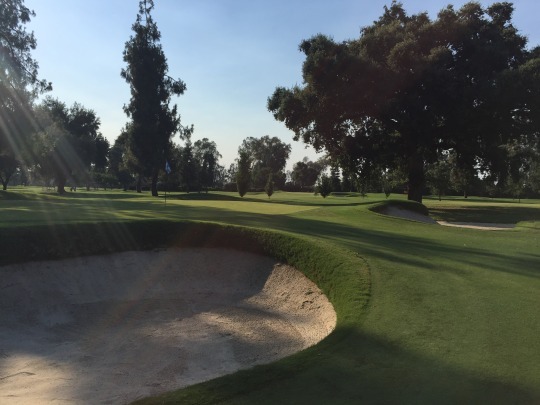 Recoveries are not easy when you find yourself in these gnarly greenside traps. 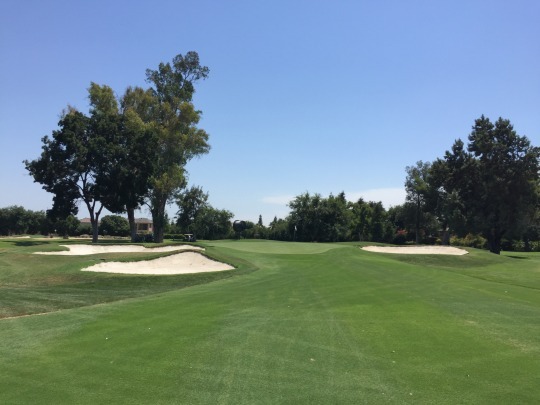 The layout and routing, outside of a few holes, is still in line with what you expect at a lot of older Central Valley courses. 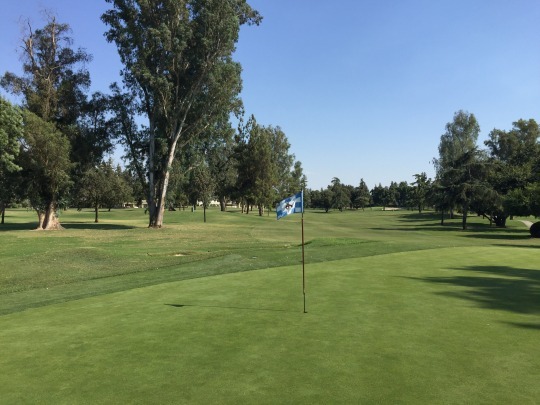 The terrain is flat, the course runs back and forth with tree-lined fairways, etc. 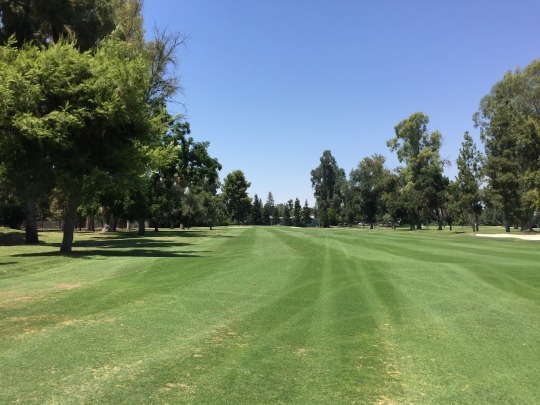 However, unlike Sunnyside, Visalia incorporates some serious doglegs and it brings water into play on several “signature” holes that definitely help it stand out. 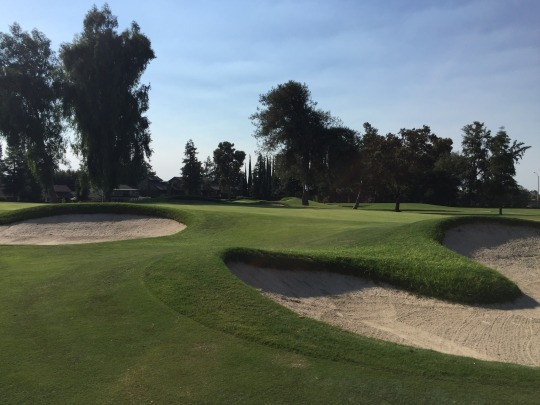 The first hole that will really jump out at you is the 7th, which reminded me somewhat of the (speaking of Desmond Muirhead) “island fairway” hole at The Sinatra (formerly Desert Island) in my new hometown of Rancho Mirage. 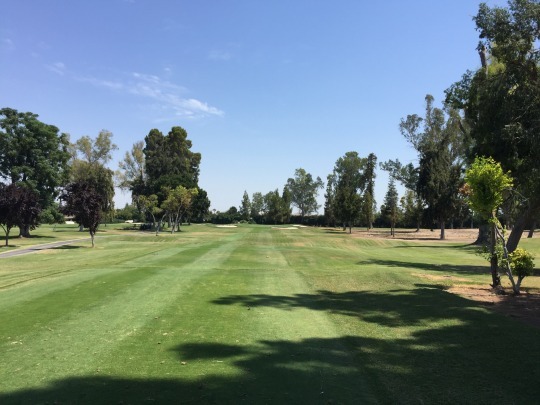 The 7th at Visalia is almost a mirror-image. 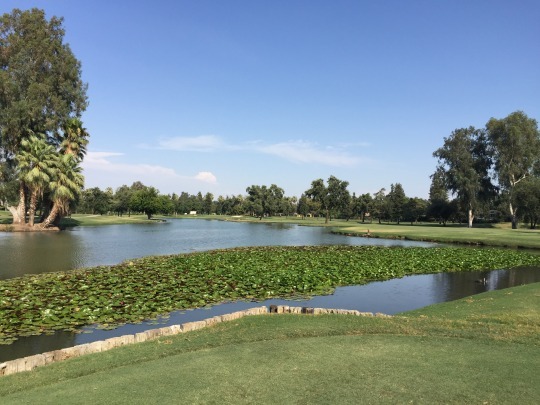 A massive water hazard stands directly between you and the green on this par-4. 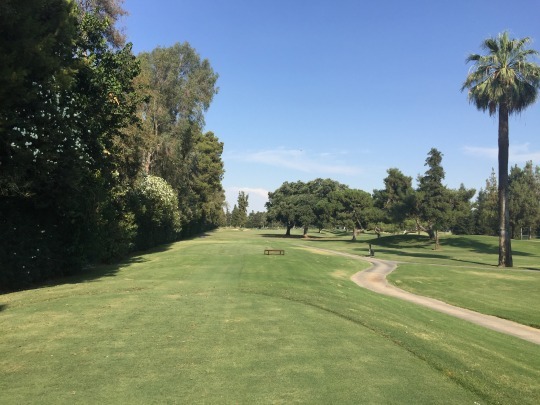 The fairway actually sits well off to the right and you have to decide how much you want to try and bite off on your tee shot. For many, it will definitely be less than driver. That’s because there is a creek that cuts across between the main fairway and the green. 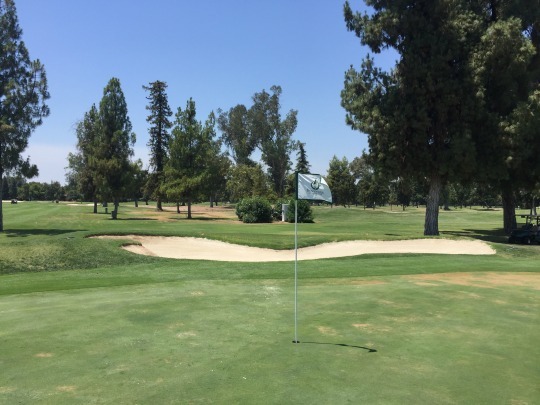 If you hit a safe drive, this hole presents a very good scoring opportunity. If you are out of position, it could get ugly! 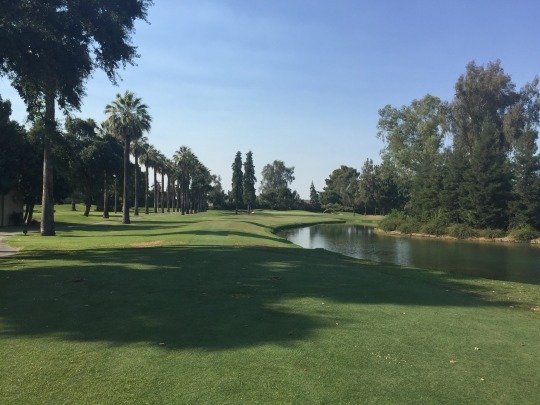 The 7th is followed immediately by the 8th, which is a nice par-3 over water. However, the signature par-3 actually comes later on the 16th hole. 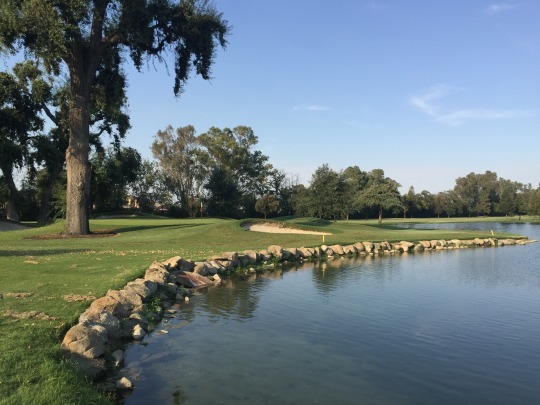 It is a beauty with a rock wall lining the hazard up by the green, some nice bunkering and a big oak tree guarding the left side of the green. 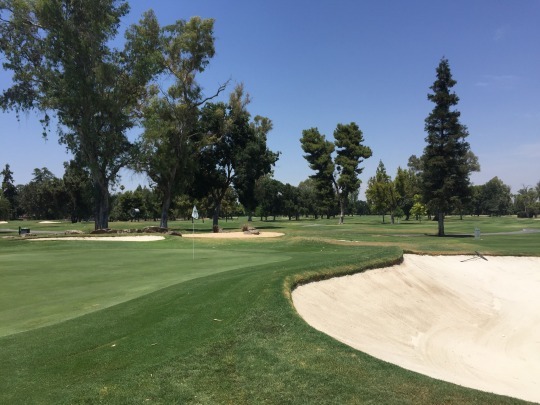 Visalia was in really nice overall condition and a clear step up from Sunnyside earlier, except for maybe the bunkers. The tee boxes were good. 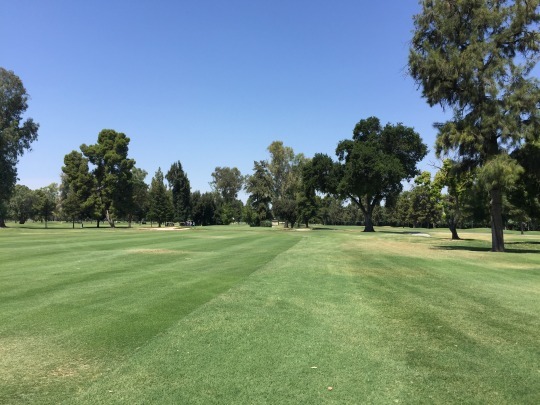 The fairways were great for the most part. They were very lush with only some minor browning here and there. The rough was mostly good. It was not too deep, but again thick and more penal than it looked. The bunkers had really nice sand, but a couple I was in had some unraked footprints. The greens were soft, but kind of springy/spongy, so some balls would really bite and others would shoot forward. The surfaces were smooth overall and rolling at medium speeds. It was interesting to play these two particular courses on the same day. 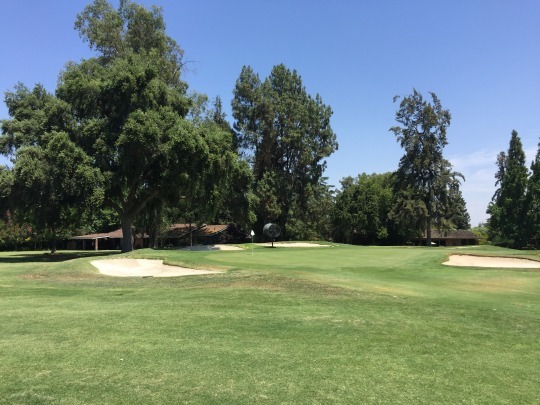 They have a lot of similarities in terms of history, clubhouse amenities and classic design elements. The main difference is that Visalia has clearly has some makeovers where Sunnyside feels like it hasn’t been altered too much in the past 100 years. I appreciated what Sunnyside stands for and I wouldn’t want to see it majorly renovated by a modern designer. However, I ultimately have to say I strongly preferred Visalia overall. I think it still represents the classic vibe of the club, but the modern design touches really put it over the top without going too far. And, it’s still a very straightforward “old style” course by today’s standards. I think it has just the right look and feel for what it wants to be.